Of course, the only way to really know how Molecule’s sheets perform is to test them yourself! So, that’s exactly what I’m going to do in this review. As a naturally warm sleeper myself, I’m excited to see how this bedding feels, which sleepers might benefit from it the most, and if it’s really as cool as they say it is! No time to read the full review? Click here to skip to the review summary! WHAT ARE MOLECULE SHEETS MADE OF? These sheets are made from a proprietary blend of cotton and Tencel, and feature a 300 thread count. This set is sateen woven, but Molecule offers percale sheet sets as well. The sateen weave gives it a luminous sheen, and a silky smooth handfeel. As we’ve learned, a sateen weave makes for a thicker sheet, so it’s going to be less crisp and cool like we get with percale, and a bit more silky and heavy. Because of the slightly heavier weight, sateen woven sheets tend to be better for cooler climate. The buttery-smooth handfeel of these sheets is, in part, thanks to the Tencel. Tencel can be a great extra ingredient to add to cotton because it’s moisture-wicking and naturally absorbent which helps keep the sheets feeling fresh and dry. It’s also derived from sustainably sourced wood pulp, and the whole Tencel production process is quite environmentally responsible compared to other forms of textile manufacturing. So, there’s a nice eco-friendly perk there. I’m testing this sheet set in white, but there are other colors from which to choose. It’s all about your preferred aesthetic and what you think will match best with your bedroom decor. Every Molecule sheet set comes with one top sheet, one fitted sheet, and two pillowcases. 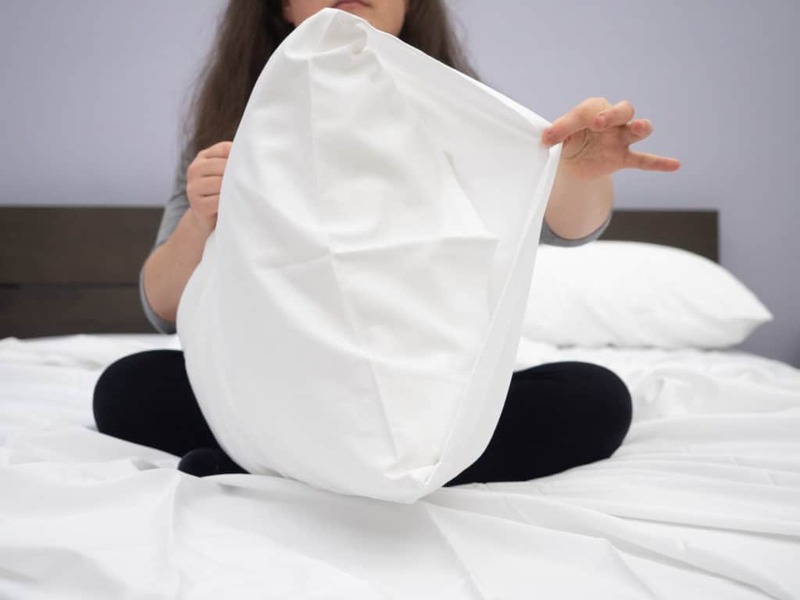 The pillowcases open on the side and feature an extra flap of fabric so that sleepers can snugly tuck their pillows away without having to worry about the tags peeking out. 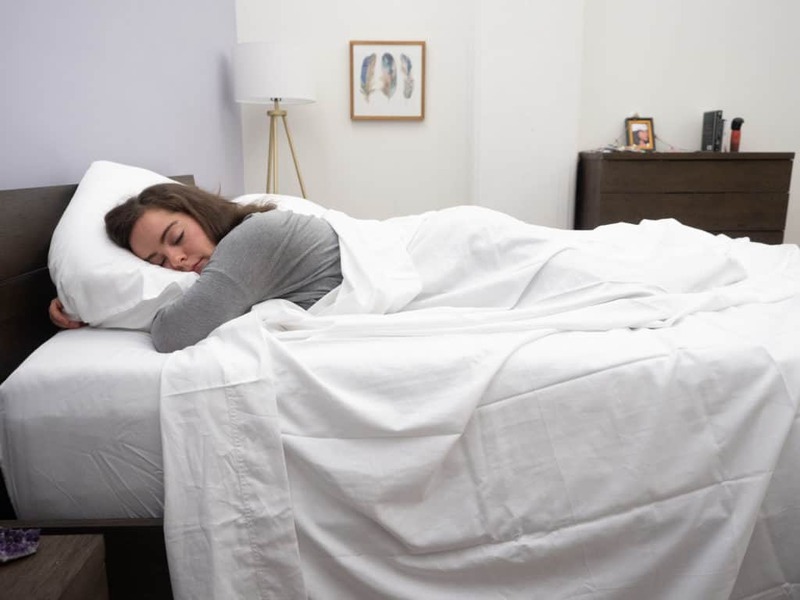 The fitted sheet is able to accomodate mattresses up to 15 inches deep, though the folks at Molecule have said that they are looking into making fitted sheets with deeper pockets (so stay tuned!). My first impression of these sheets is that they are buttery smooth, have a lovely handfeel, and a luminous sheen. But the only way to really get to know your bedding is to roll around in it — so let’s get into it! 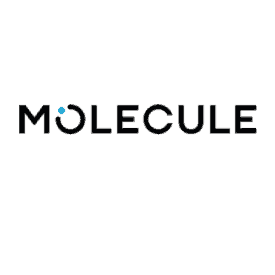 Fun Fact: Molecule sponsors world-renowned athletes like Tom Brady and Russell Wilson who offer personal input toward Molecule’s mattress designs! HOW DO MOLECULE SHEETS FEEL? As I fanned these sheets over the mattress and began my bed-making process, I couldn’t help but notice how buttery-smooth they felt in my hands, and the sateen weave adds a lustrous sheen that (in my opinion) is very pleasing to the eye. I dressed the mattress with the fitted sheet which, as I said, is capable of accomodating mattresses up to 15 inches deep. The mattress I used for this review is almost 14 inches deep, so there was only a little excess fabric which I just tucked underneath to get a really tight fit. These sheets offer a silky feel, but the Tencel seems to enhance the smoothness as well. Tencel can often feel a bit softer than cotton, so blending both materials creates a smooth, satiny handfeel. The sateen weave offers a billowy quality, particularly with the top sheet, that enhances the way the fabric drapes over the bed and your body. While the sateen weave does make for a thicker sheet, Tencel is naturally absorbent and moisture-wicking which may serve to compensate for less breathability. Molecule does advertise these sheets as “great for year-round use,” though sateen woven sheets have a reputation for being particularly compatible with cooler weather. As I slipped under the covers, the first thing I noticed was how elegantly the top sheet billowed over me as I pulled it over my body. Right away, I was feeling impressed by the aesthetic value this sheet set brings to the table. The sateen weave gives these sheets a luminous sheen and draping that, frankly, made me feel pretty fancy. I tested this set in white, but the luxurious look of these sheets definitely made me want to test out every color Molecule has to offer. In general, I enjoy cotton bedding — but when it comes to these sheets, I found the Tencel to be the star of the show. The naturally smooth nature of Tencel really bumps up the cozy factor here, and the way it combines with the sateen weave really brought a buttery-smoothness that I found irresistible. I couldn’t stop rubbing my hands and legs all over the fabric which, for me, is a sign that I found good set of sheets. As I continued to rub my hands over the fabric, I did notice that it’s the slightest bit noisy. In my opinion, it’s a small price to pay for the silky-smoothness of these sheets, but it’s worth noting that they do make a bit of a swishing sound. However, amidst my rolling around, I couldn’t help but notice that I was not being kept cool despite Molecule’s promise. Because Molecule sheets are consistently advertised as cooling, I admit that was I expecting to be kept cool regardless of a thicker sateen weave. Granted, I am a naturally warm sleeper, but I was surprised by how warm this bedding made me. I was pleased to note that the fitted sheet never even threatened to become untucked — and I’m somewhat of a restless combo sleeper, so that’s a big deal to me. And there was no denying how super soft and luxurious the fabric felt on my bare skin. But it’s a good thing that Tencel is moisture-wicking, because I was sweating after about ten minutes of testing these sheets. Ultimately though, I felt pretty compatible with these sheets. The lustrous look and silky-smooth feel bring something to the bedding game that I find to be quite special. That said, I would most likely only use this particular set in the winter time. Like I said, I’m a hot sleeper, so I don’t need a whole lot of help keeping warm. Quite the opposite, in fact. Though I have yet to test them, I have a feeling that Molecule’s percale set of sheets will offer much more in the way of cooling breathability than this sateen set. However, because the quality of the fabric is so impressive, it might not be a bad idea to get both and cycle them according to the seasons. SHOULD I TRY MOLECULE SHEETS? Loves Sateen — The way this sateen weave interacts with the super soft Tencel offers a very silky-smooth handfeel. Additionally, these sheets offers a really pretty drape and lustrous sheen that is so characteristic of this style of weave. Loves Tencel — Tencel is sustainably sourced, which adds a nice eco-friendly element to these sheets. It’s also very absorbent and moisture wicking which is great for sleepers prone to night sweats, and the hydrophilic nature of the Tencel fibers work to keep bacteria at bay. So, essentially the Tencel is working extra hard to keep you feeling fresh. Needs Time — Something that always takes the pressure off for me is a nice trial period. Molecule lets you test these sheets for 30 days, so you can kind of get the feel of them and see how they are. And if they aren’t for you, just send them on back for a refund, no questions asked. Not So Cool — Sateen woven sheets do tend to be less breathable, and I did find that to be the case with these sheets. I’m a hot sleeper, so I do prefer sheets that are going to keep me cool, and these sheets did not hit that mark for me, personally. However, I do think these sheets would be ideal for the cooler Fall months. 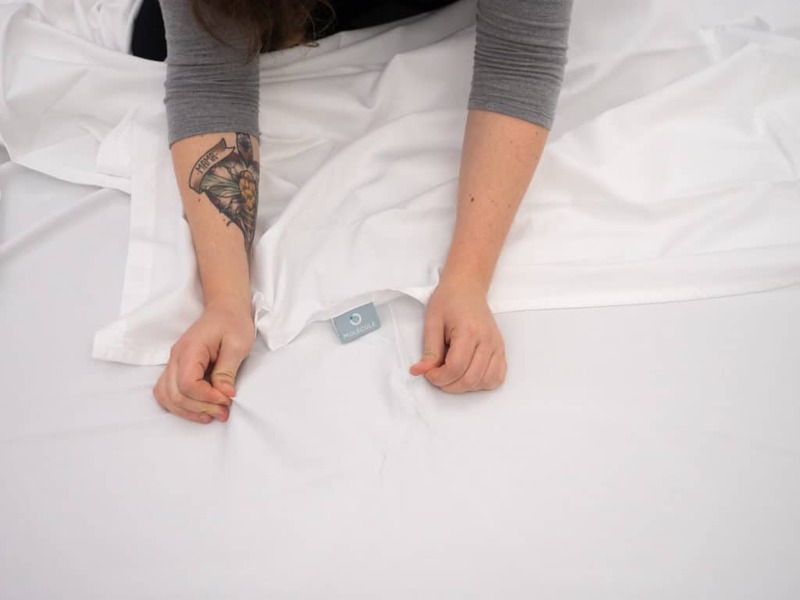 Fitted Sheet Pockets — It’s worth noting that Molecule only makes fitted sheets that are capable of accomodating mattresses up to 15 inches deep. So, for those of you who need deeper pockets to fit a taller mattresses, that’s something to keep in mind. However, I am pleased to report that Molecule is currently looking into making sheets with deeper pockets. Noisy — While I do love the silky smooth nature of these sheets, I did find them to be a little bit noisy. Not too bad, just the slightest bit of swooshing. But, if you’re a really light sleeper or are really sensitive to sounds, it might not be a bad idea to test these first. Wash Care — Wash on a gentle cycle in cold water, and tumble dry on low-heat setting. Do not over-dry. Remove from dryer, smooth, and fold.